MET ÉIREANN HAS issued a red alert snow-ice warning for Munster and Leinster, warning that ‘blizzard-like’ conditions are expected. The warning covers the period from 4pm on Thursday until 12 noon on Friday when the worst of the weather is expected to hit. A red alert warning was already in place for Dublin, Kildare, Louth, Wicklow and Meath from 5am today until 12 noon tomorrow after heavy snow fell overnight. 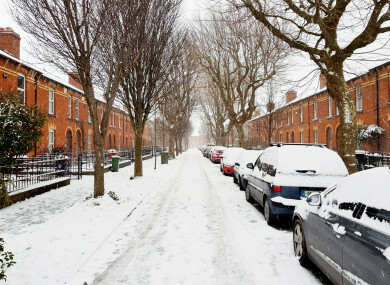 Met Eireann warned that there will be heavy snow and strong easterly winds across the two provinces from Thursday afternoon, which will cause significant snow drifts in many areas. A red alert is the most severe of the three warnings that can be issued by Met Éireann and means that there is a comparatively rare weather event due to take place which means people living in the affected areas need to take action. The action can include staying indoors, staying off roads or other actions aimed at mitigating the effects of the weather conditions. To qualify as a red alert for snow, the forecast has to call for “significant falls of snow likely to cause accumulations of 8cm” and that the situation is “likely to worsen”. Read: What does a red weather alert actually mean? Email “Met Éireann issues red alert for Munster and Leinster, warning of 'blizzard-like' conditions”. Feedback on “Met Éireann issues red alert for Munster and Leinster, warning of 'blizzard-like' conditions”.